Aim: The present study was intended to develop some novel imidazole derivatives via multi-component reaction catalysed by Ceric Ammonium Nitrate (CAN) in polyethylene glycol-400 (PEG-400) and its HMG-CoA reductase inhibitory activity for benefit in atherosclerosis. Methods: The one-pot synthesis has been achieved by taking benzyl, benzaldehyde, 3-amino-1, 2, 4- triazole-5- carboxylic acid (0.01 mol) in PEG-400 with CAN as a catalyst. These derivatives were subjected for anti-oxidant activity using DPPH free radical scavenging assay, together with determination of inhibitory activity against HMG-CoA reductase. Results: Among the tested compounds, compound 4i was identified as most promising compound exhibiting considerable quenching activity with IC50=3.1 ± 0.7 μM in DPPH assay. The compounds were further screened for HMG-CoA reductase inhibitory activity, where few analogues found to exhibit potent activity. Conclusion: All target derivatives have may exert beneficial effect in atherosclerosis via inhibition of HMG-CoA reductase together with anti-oxidant activity. Ceric ammonium nitrate, Synthesis, Imidazole, Anti-oxidant, HMG-CoA reductase. Cardiovascular Diseases (CVDs) account for more than 31% of global death in 2012. It ranked as number one cause of death across the globe and by 2030, and data suggests that over 23 million people will die from cardiovascular diseases each year. Among the diseases affecting the CVDs, Ischemic Heart Diseases (IHD) particularly in the case for acute myocardial infarction, is one of the chief causes of a leading cause of morbidity and mortality. It occurs in numerous array of conditions which including trauma, vascular reflow after contraction, percutaneous transluminal coronary angioplasty, thrombolysis treatment, and organ transplantation . Recent studies suggest that, atherosclerosis is the main cause of IHD and a major cause of Ischemic Stroke (IS), the most common type of stroke. Thus, agents that were used to reduce hypercholesterolemia via inhibition of enzymes necessary for cholesterol biosynthesis deemed advantageous over other agents . Being as a rate-limiting step in cholesterol biosynthesis, the inhibition of Hydroxymethylglutaryl- Coenzyme A (HMG-CoA) reductase causes upregulation of Lipoprotein cholesterol (LDL-c) receptor and makes them easily cleared from the bloodstream [3,4]. The oxidative stress is the major stimulus which arises due to imbalance between oxidant and antioxidant systems of the body favouring the progression of IHD. This leads to the production and accrual of Reactive Oxygen Species (ROS), which includes superoxide anion and hydroxyl radicals . Consequently, use of efficient oxidant which has a capability to cleave ROS has beneficial effect into preventing and delaying the onset of IHD. Imidazoles have a long history in the medicinal chemistry to act as antitumor, antifungal, cardioprotective, alpha-blocker, CNS-depressants, anticonvulsants, antiprotozoal and anthelmintic agents . Particularly, the pronounced cardioprotective effect of necrostatin-1 (Figure 1), an imidazole derivative, has prompted us to develop some newer imidazole analogues in search of potent analogues . 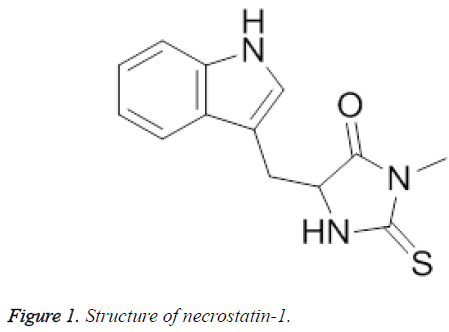 Figure 1: Structure of necrostatin-1. Consequently, the present manuscript deals with the development of some novel imidazole derivatives via multi-component reaction catalysed by Ceric Ammonium Nitrate (CAN) in PEG-400 and subsequently tested for possible pharmacological effect. These types of reactions (i.e., MCRs) are considered as the most influential synthetic tools which enable the medicinal chemist to have access to complex structural motif in easy way. Additionally, these reactions are also deemed environmental friendly because of reducing the number of synthetic steps, waste production and energy consumption. It offers the advantage of simplicity in synthetic work up and efficiency over conventional chemical reactions . All chemicals were of analytical grade and were obtained from Sigma Chemicals, St Louis, USA. Double distilled water was used for all biochemical assays and in respect of statistical analysis the values are expressed as mean ± SE. Unpaired Student’s T-test was applied to test the significance of biochemical data of different groups. Significance was set at P<0.05. The completion of the reactions was monitored by Thin Layer Chromatography (TLC), on aluminium plates coated with silica gel with. Melting points were measured on a Reichert 723 hot stage microscope, and are uncorrected. Initially, benzil (0.01 mol), benzaldehyde (0.01 mol), 3- amino-1, 2, 4-triazole-5- carboxylic acid (0.01 mol) in PEG-400 were mixed. To this, CAN (10 mol (%)) was added and reaction mixture was stirred at 50°C for the required time as determined by TLC. After completion of the reaction, the resultant mixture was kept in dry ice-acetone bath to precipitate the PEG-400. The mixture was then extracted with Ether, due to insolubility of PEG-400 which affords the corresponding pure products. The purity of compounds was confirmed on comparing the observed melting point with earlier reported . Results suggest that, the melting point were found in acceptable limits. Where Abscontrol is the absorbance of DPPH radical in methanol; Abssample is the absorbance of DPPH radical solution mixed with sample test compound /standard. All determinations were performed in triplicate (n=3). It was performed according to the method given elsewhere taking 1-50 μM of compound concentration. The results are expressed as IC50 value [10,11]. The HMG-CoA reductase inhibitory activity was assayed spectrophotometrically, following the method of Kleinsek et al. whereby the rate of decrease in absorbance at 340 nm due to the oxidation of NADPH was measured. The standard assay mixture contained 0.1 mM HMG-CoA, 0.2 mM NADPH, 0.2 mM KCl, 4 mM EDTA, 10 mM dithiothreitol, and 160 mM potassium phosphate buffer (pH 7.0) in a total volume of 140 μL. The reaction mixture containing the enzyme (100-150 μL) and all components except HMG-CoA were prior monitored to detect any HMG-CoA independent oxidation of NADPH. Before bioassay, the test compounds were dissolved in 0.1 mol/L NaOH/THF (1/1) (during the process, the lactone was hydrolyzed into the sodium salt of dihydroxy acid) and diluted with the buffer. The role of catalyst in any MCRs is highly significant to catalyse the organic transformations, thus, in present paper, we have used Cerium (IV) Ammonium Nitrate (CAN) as a catalyst. It behaves as electron transfer oxidizing agents to catalyse numerous organic transformations, such as, oxidation, protection, nitration, thiocyanation, cycloaddition, 1, 4- addition, 1, 3-dipolar esterification, and the Hantzsch reaction. It acts via generation of radical intermediates and has been associated with many advantages, such as, admirable water solubility, cost-effectiveness, eco-friendly green nature, ease of handling, high reactivity and convenient work-up procedures . In regard of solvent, PEG-400 as a medium for the reaction has gained attraction from many chemists because of its, high thermal stability and homogeneous phase. It also allows creation of necessary molecular interactions for completion of reaction . Thus, we have used CAN as a catalyst for the synthesis of various imidazoles in the presence of PEG-400. The synthesis of target compounds has been depicted in Figure 2. Figure 2: Synthetic route for the development of Imidazole derivatives. Initially, the synthesis was aimed to optimize the reaction condition. To this, an equimolar concentration of the benzil (1 mmol), aldehydes (1 mmol), 3-amino-1, 2, 4-triazole-5-carboxylic acid Thus, to illustrate the effect of catalyst, the reaction was performed with or without using the catalyst. The results have been shown in Table 1. As a matter of fact, in the absence of catalyst, the reaction does not proceed smoothly and took longer time to afford the product in very low yield (30 h). On introduction of the catalyst, the yield of the product was significantly improved accompanied with shorter reaction time. The time taken to complete the reaction was further improved on increasing the catalyst load to 15 mol%. However, till 10 mol% of loading, the yield of the product was increased, but on further increasing the load, the yield was not improved. The results suggest the role of CAN as a catalyst for the reaction. In next instance, the effect of temperature on the reaction was determined. To begin with, the reaction was carried out at less than room temperature which showed that no formation of the desired product was takes place. However, as shown in Table 2, on increasing the temperature to 50°C, the reaction was completed successfully and leads to afford the product in highest yield (96%). On additional increasing the temperature, viz., 70-90°C, the yield of the product does not improved, but the reaction completes in shorter reaction. After deciding the optimal reaction conditions, we move towards determining the versatility of the reaction employing diverse set of electron withdrawing and electron donating substituent. Table 1: Catalytic efficiency of CANa. aReaction conditions: benzil (1 mmol), aldehydes (1 mmol), 3-amino-1, 2, 4-triazole-5-carboxylic acid (1 mmol), CAN: 10 mol%, PEG-400: 50Â°C; bIsolated and un-optimized yields. Table 2: Effect of temperature on the reaction completiona. As depicted in Table 3, the entire set of target compounds were synthesized in efficient yield. Among the synthesized derivatives, entry 4a revealed the highest percentage of product formation. Whereas, the presence of electron withdrawing group takes the much longer time to complete the reaction (compounds 4b, 4c and 4g takes 6 h). The product yield and time to complete the reaction was significantly improved in the case of rest of the molecules. It was indicated that compounds containing electron donating groups were found more suitable their electron withdrawing counterpart. Moreover, the melting point of the compounds was found in accordance with earlier reported literatures. aReaction conditions: benzil (1 mmol), aldehydes (1 mmol), 3-amino-1, 2, 4-triazole-5-carboxylic acid (1 mmol), CAN: 10 mol%, PEG-400: 50°C; bIsolated and un-optimized yields; cReported . Table 3: Synthesis of distinguished imidazole derivativesa. DPPH antioxidant assay: The free radical contributes the pathogenesis of IHDs, thus effective control of these free radicals could be option of worth consideration. Thus, the target compounds were assayed for antioxidant activity in DPPH free radical scavenging assay as showed in Table 4. This assay was based on the determination of the ability of the compound to scavenge free radicals driving the oxidation process. Particulary, 1, 1-Diphenyl-2-picrylhydrazyl (DPPH; I) is a stable free radical and on accepting hydrogen from a corresponding donor, its solutions lose the characteristic deep purple (λmax 515-517 nm) colour. It is a very popular method for the study of antioxidants . The antioxidant behaviour of the tested derivatives was expressed as relative or absolute decrease of concentration of DPPH or as IC50 (concentration of a compound decreasing the absorbance of a DPPH solution by 50%). The compounds were assayed over a concentration range of 1-50 μM. As depicted in Table 4, it has been found that entire set of derivatives exhibit considerable anti-oxidant activity. It has been found that compounds having the trihydroxy group (4i) showed the prominent inhibitory activity with IC50=3.1 ± 0.7 μM. Further, significant radical quenching activity was observed in the case compound containing the electron withdrawing group. Among them, the compounds having isomeric hydroxyl substituent was found to exhibit almost similar activity (Compounds 4d and 4e). Whereas, compound with methoxy and hydroxyl (Compound 4h) showed much improved activity and on replacing the methoxy with ethoxy (Compound 4i) keeping the hydroxyl constant, the activity was abolished. To our surprise, on completely removing the -OH as in the case of compound 4f, the activity was fallen drastically. Thus, it was indicated that, compounds containing substituents, such as -OH or -OCH3 have much improved radical scavenging activity than their halogen substituted counter parts. It was also revealed that, presence of -OH makes the compound much more active along with presence of –OCH3. Whereas presence of ethoxy rather than methoxy render compound less active. Table 4: Free radical scavenging capacities of target compounds 4a-4j by the DPPH methoda. The entire set of compounds was assayed for inhibition of rat liver HMG-CoA reductase activity in vitro according to the method of Kleinsek et al. . The method suggests determining the decrease in rate of absorbance at 340 nm due to the oxidation of NADPH. The assay system without any inhibitor was taken as the negative control, whereas, the test compounds which gave the decreased UV absorbance more than 80% of that in negative control were defined as no significantly active ones. Moreover, results suggest that, only 5 compounds giving less than 80% of decreased absorbance would forwarded to the secondary screening (IC50 determination). Among the tested series, in preliminary screening, only 5 compounds were found to possess considerable inhibition of HMG-CoA reductase. As presented in Table 5, only compounds 4i and 4h showed to exhibit more potent activity than the standard drug. The remaining compounds (4c-4f) showed considerable inhibition of HMG-CoA reductase. For instance, compound 4c showed least activity. The activity was further improved in the case of compounds 4d and 4f. Thus, it can be suggested that, the tested compounds showed significant inhibition of HMG- CoA reductase and have beneficial effect in mitigating the symptoms of atherosclerosis. Table 5: In vitro HMG-CoA reductase inhibitory activity. We have developed a series of imidazole derivative via onepot, multi-component reaction. This strategy proved as successful in generating these constitutive compounds in excellent yield in short reaction time. Further, owing to its HMG-CoA reductase together with anti-oxidant mechanism may provide a clue for the generation of newer analogues with potent anti-atherosclerotic activity. WHO. Cardiovascular Diseases (CVDs) Fact sheet N°317 Updated 2015. Norlin M, Wikvall K. Enzymes in the conversion of cholesterol into bile acids. Curr Mol Med 2007; 7: 199-218. Vaziri ND, Liang K, Azad H. Effect of cyclosporine on HMG-CoA reductase, cholesterol 7alpha-hydroxylase, LDL receptor, HDL receptor, VLDL receptor, and lipoprotein lipase expressions. J Pharmacol Exp Ther 2000; 294: 778-783. Kostner GM, Gavish D, Leopold B, Bolzano K, Weintraub MS, Breslow JL. HMG CoA reductase inhibitors lower LDL cholesterol without reducing Lp(a) levels. Circulation 1989; 80: 1313-1319. Kumar D, Jugdutt BI. Apoptosis and oxidants in the heart. J Lab Clin Med 2003; 142: 288-297. Zhang L, Peng XM, Damu GL, Geng RX, Zhou CH. Comprehensive review in current developments of imidazole-based medicinal chemistry. Med Res Rev 2014; 34: 340-437. Smith CC, Davidson SM, Lim SY, Simpkin JC, Hothersall JS. Necrostatin: a potentially novel cardioprotective agent? Cardiovasc Drugs Ther 2007; 21: 227-233. Cioc RC, Ruijter E, Orru RVA. Multicomponent reactions: advanced tools for sustainable organic synthesis Green Chem 2014; 16: 2958-2975. Nikalje APG, Ghodke MS, Khan FAK, Sangshetti JN. CAN catalysed one-pot synthesis and docking study of some novel substituted imidazole coupled 1, 2, 4-triazole-5-carboxylic acids as antifungal agents. Chinese Chem Lett 2015; 26: 108-112. Prior RL, Wu X, Schaich K. Standardized methods for the determination of antioxidant capacity and phenolics in foods and dietary supplements. J Agric Food Chem 2005; 53: 4290-4302. Sharma HK, Kumar A. Evaluation of total phenol, flavonoid and in vitro antioxidant activity of methanolic extract of leaves of Melastoma malabathricum, Linn. Asian J Chem 2011; 23: 434-438. Kleinsek DA, Dugan RE, Baker TA, Porter JW. 3-hydroxy-3-methylglutaryl-CoA reductase from rat liver. Methods Enzymol 1981; 71: 462-479. Sridharan V, Menendez JC. Cerium (IV) ammonium nitrate as a catalyst in organic synthesis. Chem Rev 2010; 110: 3805-3849. Singh UP. PEG-400. Syn Lett 2012; 23: 2721-2722.